MONTEREY, Calif., August 16, 2014 – There are many elements that contribute to the mystique of vintage motor racing, but famous names of drivers from the past transcend all else. 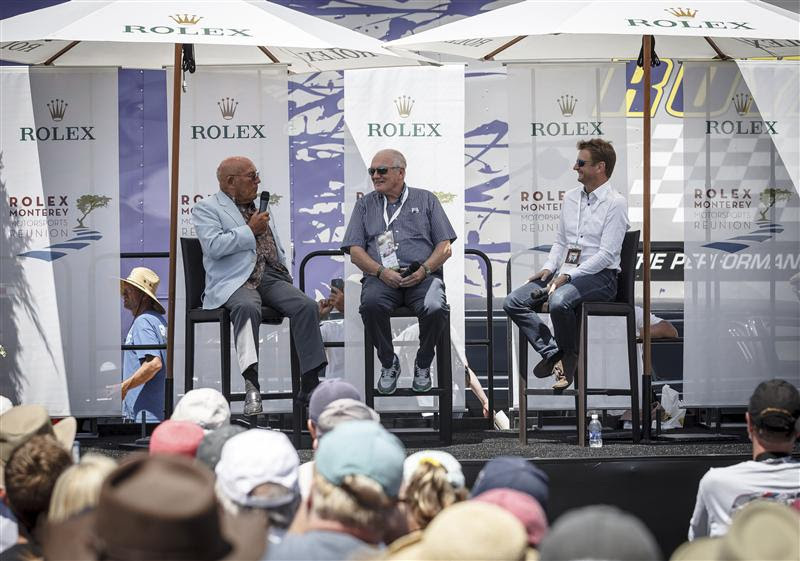 At today’s Rolex Monterey Motorsports Reunion, Sir Stirling Moss, one of the sport’s greatest drivers and most recognizable names, made a stir as an honored guest. Indeed, his presence was no less regarded than that of a famous movie star, and after the knighted driver bantered at a lunch break “picnic” for the attending public’s pleasure with the recently retired Scottish driver Allan McNish (three-time winner of the 24 Hours of Le Mans, most recently in 2013), he obliged hundreds of fans with autographs on everything from a vintage steering wheel to a 1956 photo—showing him dashingly at his prime–that had been saved by a fan for just such a lucky day. 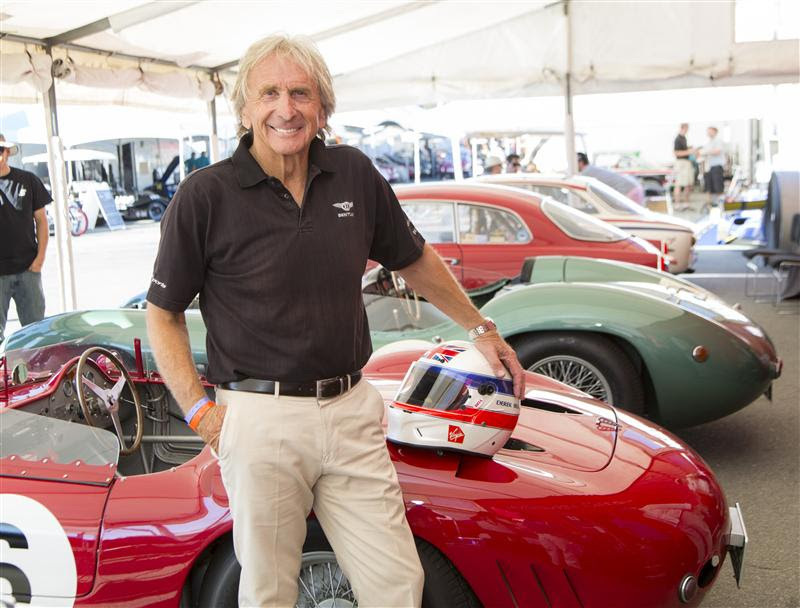 Another folk-hero driver, Derek Bell, drove a 1957 Maserati 300S in today’s races, which hosted seven groups of historic automobiles determined by era or class. (Tomorrow, eight entirely different groups will have their turn.) Bell made his mark in motorsports by winning Le Mans five times, The World Sportscar Championship twice, and the Rolex 24 At Daytona three times. 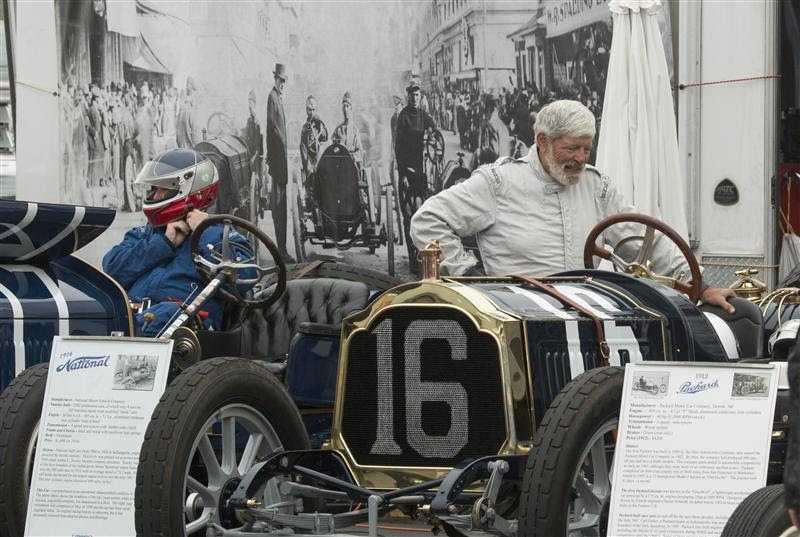 Not all the professional drivers at the Rolex Monterey Motorsports Reunion are retired. Marino Franchitti is currently competing in the Tudor United Sportscar Championship but also races in select vintage races. Although most of the vintage cars raced in anger before he was born, he appreciates the history they represent. Like the drivers, vintage racing fans like the cars when they are as close to original as possible, obviously with safety improvements within that. Sometimes spectators are surprised to see a rare car, which they thought was only for display, come alive. Today when Brian Blaine’s (Visalia, Calif.) minimally restored1923 Ford Model T took a rumbling spin through Pre-War Alley, it almost seemed as natural as having the oldest running Maserati in the world, a red 1928 Tipo 26B that was center stage in the Maserati Heritage Display, join in for a special lap around the track with two faster, sleeker Maseratis: a1955 300S and a 1958 250F that were raced here today. Mazda Raceway Laguna Seca was established in 1957 by the Sports Car Racing Association of the Monterey Peninsula (SCRAMP), a not-for-profit 501C(4) corporation. Each race season, SCRAMP donates its net proceeds to the volunteer groups that help put on the races. Max Verstappen (Van Amersfoort Racing) had a perfect start as a Red Bull Junior Team member: at the Nürburgring, the 16-year-old won his first outing in the colours of the Austrian Formula 1 World Championship-winning team. At the 3.629 kilometres long sprint circuit, he won the entertaining 25th FIA Formula 3 European Championship season round from Antonio Fuoco (Prema Powerteam) and Antonio Giovinazzi (Jagonya Ayam with Carlin). At a drying track, the Dutch rookie driver scored his eighth win of the season and was thus able to reduce the gap to the championship leader. Frenchman Esteban Ocon (Prema Powerteam), who finished sixth in the Nürburgring race, remains on top in the drivers’ standings. The race started at a still wet, but already drying track. Nevertheless, three drivers took the risk of starting with rain tyres: Richard Goddard (ThreeBond with T-Sport), series’ novice Wing Chung Chang (Team West-Tec F3) and Michele Beretta (Eurointernational). Especially Goddard, who had started from 20th place, benefited from his initial tyre advantage and took the lead on lap seven. On lap 13, he lost it again because his rain tyres degraded and in spite of a spirited drive, he was left without a chance against the faster Max Verstappen. In the remainder of the race, the Australian dropped back more and more and eventually crossed the finish line in 19th place. Out in front, Verstappen only managed to pull clear from his main rival Antonio Fuoco, while the latter had his compatriot Antonio Giovinazzi in his rear-view mirrors until the end of the race. Jordan King (Carlin) took the chequered flag in fourth place from Tom Blomqvist (Jagonya Ayam with Carlin) and Esteban Ocon, who battled for a long time. Lucas Auer (kfzteile24 Mücke Motorsport), Felix Rosenqvist (kfzteile24 Mücke Motorsport), Santino Ferrucci (Eurointernational) and Edward Jones (Carlin) rounded out the top ten in a race that had plenty of excitement. In qualifying for the 25th season race of the FIA Formula 3 European Championship, Max Verstappen (Van Amersfoort Racing, 1:37.036 minutes) came out on top and claimed pole position on a rain-soaked track. The 16-year-old Dutchman, who was appointed a member of the Red Bull Junior Team only a few days ago, completed the 3.629 kilometres long Nürburgring sprint circuit 0.649 seconds faster than second-placed Edward Jones (Carlin, 1:37.685 minutes). Santino Ferrucci (Eurointernational, 1:38.079 minutes) claimed third place, his best classification in a FIA Formula European Championship qualifying to date. The youngest driver in the field was 0.074 seconds faster than Lotus Formula 1 junior driver Esteban Ocon (Prema Powerteam, 1:38.153 minutes), who had to make do with fourth place. Max Verstappen dominated the entire first qualifying and eventually claimed first place. Edward Jones only moved up into second place in the final seconds of the session. Santino Ferrucci also set his personal fastest time in the closing stages and moved up to third place. As a result, Esteban Ocon, the FIA Formula 3 European Championship points’ leader, dropped back from second to fourth place just before the end of the session. Antonio Fuoco (Prema Powerteam, 1:38.262 minutes) and Lucas Auer (kfzteile24 Mücke Motorsport, 1:38.375 minutes) also lost two positions in the closing stages. They ended up fifth and sixth respectively. Seventh place behind Austrian driver Auer went to Italian Antonio Giovinazzi (Jagonya Ayam with Carlin, 1:38.501 minutes), who scored his maiden FIA Formula 3 European Championship race win at the Red Bull Ring a fortnight earlier. His team-mate Tom Blomqvist (Jagonya Ayam with Carlin, 1:38.610 minutes) was classified eighth from Roy Nissany (kfzteile24 Mücke Motorsport, 1:38.728 minutes) and Felix Rosenqvist (kfzteile24 Mücke Motorsport, 1:38.735 minutes). MONTEREY, CA, For thousands of historic car racing fans at the Rolex Monterey Motorsport Reunion, Saturday was the day to snag an autograph from Sir Jackie Stewart, and, if particularly lucky, also catch a glimpse of other driving legends mingling with the crowds. Sir Jackie, the British former Formula 1 driver from Scotland who has won three World Championships, participated in the event as a Rolex Testimonee and special guest, while other motor sports luminaries came with no official agenda, just one of relishing the best moments that today’s activities at Mazda Raceway Laguna Seca had to offer. That’s the way it seems to roll here at one of the most popular events of the Monterey Peninsula’s annual Classic Car Week. There is much that is planned and precisely timed, including qualifiers and Rolex Races that run 20 minutes each this weekend for 16 period-specific competition groups, and much that is spontaneous, such as owners and drivers sharing facts about their cars as well as their experiences restoring and driving them with show goers who are able to freely roam the paddock area and inspect up-close the cherished metal reminders of the past. Wandering is as much a part of the Reunion experience as watching the races, and today’s “Picnic in the Park” at the Yamaha Marketplace featured the “Flying Scot” swapping war stories with Corvette Racing team’s Tommy Milner while hundreds listened in awe. Stewart, who was the #2 driver in his first year with BRM, explained that, Hill, as the #1 driver, would have normally started the race, but being the “fair” gentleman that he was, suggested a coin toss, where whoever lost would start the race. “Then he said, ‘in any case, what you want do is at the end of the Straight, you stick it into the sand bank on the first lap (he was joking). What was funny about the joke is that he actually did just that (after losing the coin toss). Since there was no engine braking, he made the mistake of braking with the other cars, and the other drivers were braking and downshifting to second gear in order to slow their cars, and sure enough, he visited the sand bank, and the turbine swallowed the sand, which took the edge off the turbine blades, so right from the beginning of the race, we were running 45,000 revs instead of 75,000 revs. The darn thing lasted the whole race, which was a real disappointment, because we were going so slow that I remember getting passed by a Triumph Spitfire. Jochen Rindt won the race in an LM Ferrari with his American co-driver Masten Gregory, and he was lapping me every few laps. Each time he passed me, he jokingly gave me a rude gesture. In the third race of the FIA Formula 3 European Championship at the 3.629 kilometres short circuit lay-out of the Nürburgring, Raffaele Marciello (Prema Powerteam) completed his perfect weekend: the Zürich-born Italian extended his lead in the drivers’ standings to 72.5 points. Lucas Auer (Prema Powerteam) and Luis Felipe Derani (Fortec Motorsports) rounded out the podium after the third race. Felix Rosenqvist (kfzteile24 Mücke Motorsport), second in the drivers’ standings, had to make do with fifth place behind Harry Tincknell (Carlin). The race started with plenty of action: on the opening lap, several of the young drivers collided and had to retire. Among them were Jordan King (Carlin), Sven Müller (ma-con), Richard Goddard (ThreeBond with T-Sport) and Alexander Sims (ThreeBond with T-Sport). As a result, the clerk of the course sent the safety car out. After the re-start, Raffaele Marciello defended his lead, followed by Lucas Auer and Luis Felipe Derani. Auer was able to keep up with his leading team-mate for a long time while the two Prema drivers extended their gap to third-placed Derani. Towards the end of the race, Marciello also extended his margin over Auer and drove an undisputed lights-to-flag victory home. For Brazilian Derani, his third place was his second podium result of the season after he had his premiere on the podium of the FIA Formula 3 European Championship yesterday. Alex Lynn (Prema Powerteam), Michael Lewis (kfzteile24 Mücke Motorsport) and Mitchell Gilbert (kfzteile24 Mücke Motorsport) rounded out the top eight in the 21st season round of the FIA Formula 3 European Championship. Australian Gilbert scored his first points of the year. He finished ahead of Eddie Cheever (Prema Powerteam) and Antonio Giovinazzi (Double R Racing), who were ninth and tenth respectively.